Patatas Castellanas, Thyme for Cooking easy sides. These flavorful potatoes, are braised in a skillet with paprika, garlic and onion, with a bit of flour to thicken. Great served with spicy pork or chicken. Cut the potatoes into 1/2" (1.25cm) cubes. Heat oil in medium nonstick skillet or large saucepan. Add oil, onion, garlic and sauté briefly. Add potatoes and sauté 5 minutes. Add paprika and flour, stir well and sauté 1 minute. Cover and cook until potatoes are tender, about 15 minutes. Most of the stock should be absorbed. Check them periodically, if they start to dry out too soon add a bit more stock. 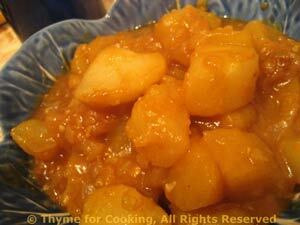 When potatoes are tender if there is still a bit of stock left, uncover and cook it off. Serve.